When it’s too hard to actually say it, LazyHusband comes to your rescue. Please send us your funniest phrase. If you win this contest, your phrase may be included in the app for a limited time. By entering this contest, you agree to the following rules. UPDATE: Deadline extended to 3/31. 2. On 3/31, we’ll select the top 3-5 phrases and put up a wedgies survey. 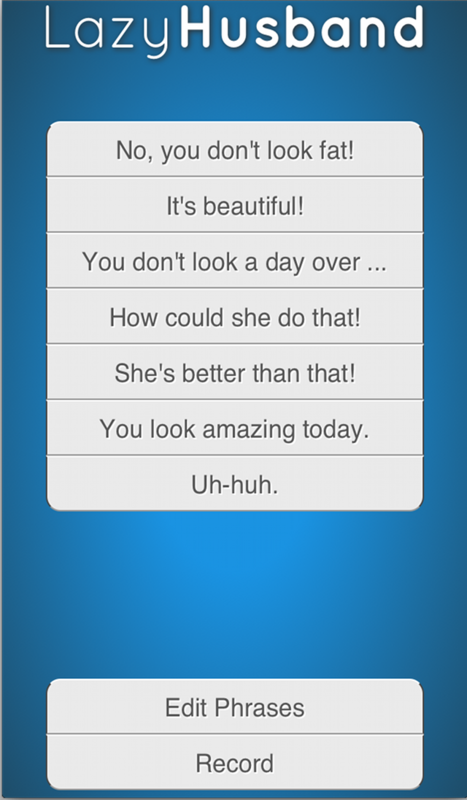 The top vote getter by 4/7 will get their phrase used in the app for a limited time. You’ll also win a LazyHusband t-shirt in the size of your choice, unless that happens to be illegal where you live (see Note below). 3. By entering this contest, you agree to grant LazyHusbandApp a worldwide, non-revokable, royalty-free license to use your phrase in the LazyHusband app. In return, we will promote the winner of the app on our blog and via Twitter. Plus, you’ll be doing a 12 year old a solid. 4. We reserve the right to change these rules at any time. We won’t do anything really bad though, and we’re new at this, so we’d appreciate if you would cut us some slack. Note: This contest void where prohibited. But it probably isn’t prohibited anywhere since there are no cash prizes. But you might want to check just in case.